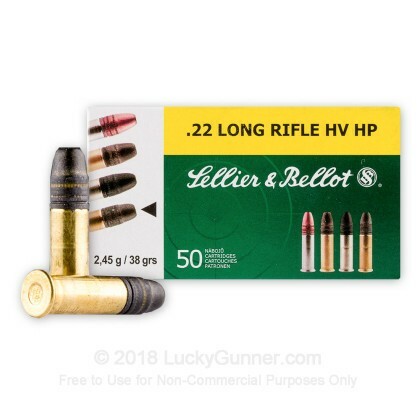 New from Sellier & Bellot is a fantastic 22 Long Rifle High Velocity 38 grain Hollow Point (HP) round. This round is great for both target practice and for varmint hunting. The hollow point lead bullet expands on impact to ensure you deliver full energy to your target. 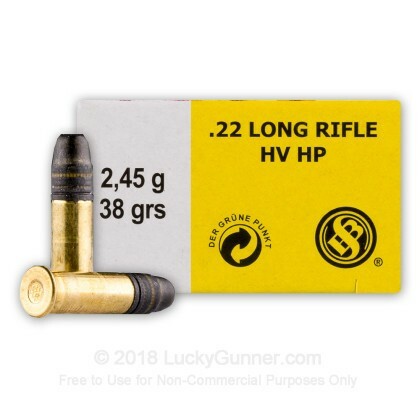 Fast moving and hard hitting, you're sure to fall in love with this new production brass-cased, rimfire primed, non-corrosive 22 LR ammo. Runs in all of my 22’s flawlessly. Even my picky sig mosquito. The Walther P22 is picky about the ammo it likes. This ammo cycles and runs great through it with no problems. 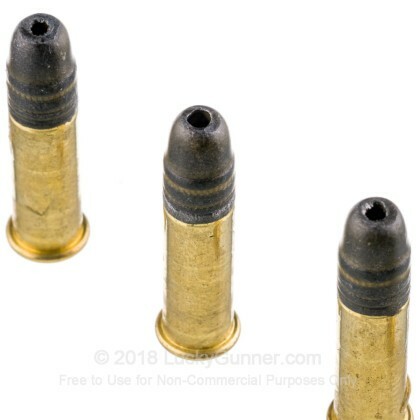 This is the only ammo that my sig 1911-22 will shoot without problems. Excellent for that gun. I have a single bolt action keystone rifle and an Taurus PT-22 pistol which some people say is very picky about the ammo. 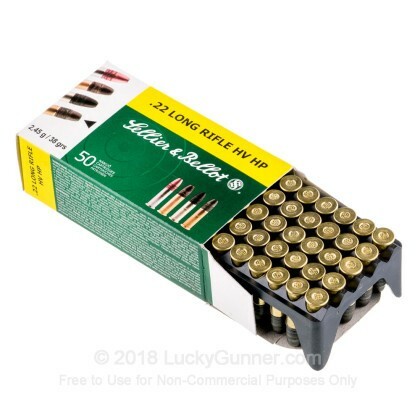 I bought a few 50 round boxes of this brand and before i went to the range, I wiped down 100 rounds with just a paper towel. I did not have "one" issue. 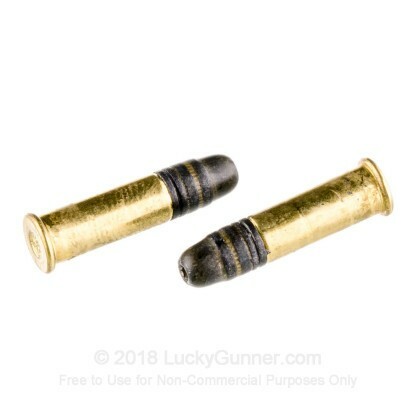 It's also just a dirty as other ammo out there. Excellent ammunition! Excellent Customer service! Less then 24 hr shipping! Shot this ammo in a H&R 9 shot revolver, and spent cartridges swell when fired, so they cannot be extracted from the cylinder using the extraction rod, have to dig them out using a jewelers precision screwdriver! Will not buy this ammo again! Ran these through my grandsons new Mossberg 715T. 300 rounds, no problems. I bought 500 rounds. It came in boxes of 50. The first two boxes worked just fine in my Ruger 10/22 and pistol. Then came the next boxes (all the rest). The rounds are covered in a waxy substance like you found on old .22LR ammo from years past. The first round fires and the rest all fail to feed. In 10 round or 25 round magazines in the 10/22. I will have to use these in my old 1914 Savage pump. Disappointed. I won't by this ammo again. Not the fault of LG. I like dealing with them. Ammo does not load well. Using ruger BX25 mags through my ruger 10/22. Nothing but problems. Will not buy this ammo again. 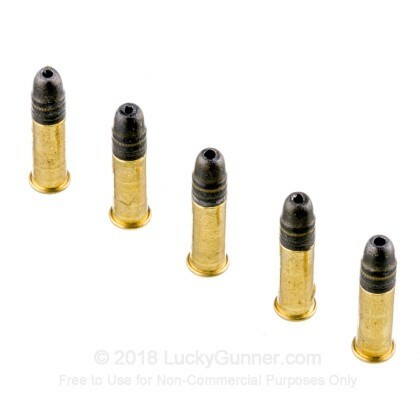 Best ammo for the best price. Wide variety of ammo at some of the best prices on the market. Fast delivery too. I'll keep buying from lucky gunner. Thie ammo is accurate but dirty. Must clean my Ruger 22/45 and break the gun down after each Range session. Will probably find cleaner ammo. Only purchased this ammo to have something to test in my new rifle. Found it to be quite greasy and difficult to load in magazines. This grease / lubricant also attracted a lot of dirt and contributed to increased fouling in my rifle. Will not buy it again. I will buy from them again and keep them as my regular supplier... thanx Guys.